Arson attack … The Zanu PF offices after the fire, the ruling Zanu PF party has been blocked from reoccupying its former offices at Machipisa Shopping Centre in Highfield, Harare after it failed to settle rental arrears. The development has forced party members to hold district meetings under trees. The party was forced to vacate the offices in 2013 after they caught fire in a suspected arson attack soon after that national elections held in July. The building is owned by one of the first high profile black business family in the country, Machipisa Brothers with the shopping centre named after them. 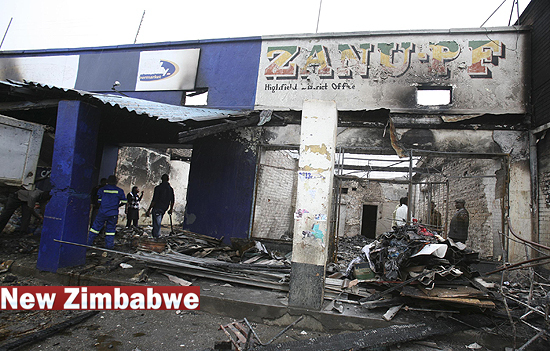 Before the alleged arson attack, Zanu PF shared the building with a supermarket, Grocery World, which lost goods worth thousands of dollars during the inferno. The Machipisa Brothers have since renovated the complex and are leasing the entire building to the supermarket. Zanu PF sources in Highfield said the party wanted to reoccupy its former offices after they were renovated but were told to first to settle outstanding rentals, water and electricity bills, which are reported to be running into thousands of dollars. The party reportedly failed to pay the sum. Since independence in 1980, the Zanu PF Machipisa offices had been a popular meeting place for the party’s members and supporters. The offices were also infamous with opposition supporters and members of the public as they were reported to have been used as a torture base during elections. Failure to settle the arrears has now forced local party’s structures in the teeming high density area to hold their crucial meetings under a tree along Jabavu Drive close to the shopping centre. “We thought that the party leadership would help chip in and settle the arrears but no one seemed to care; that is why our regular meetings are now disjointed as we are now holding them under a tree. “If it is a bigger meeting, we go to an open space next to Mhizha Primary School, which is very embarrassing for a ruling party,” said a branch chairperson in Highfield East. He claimed the 2013 arson attack on the building had worked in favour of the Machipisa Brothers as they found a way to evict the party from its building. After the fire, police arrested one Collins Chisunga of Old Highfield who was accused of bragging in bar that he had travelled from South Africa to attack the offices.